Citation Information: J Clin Invest. 2016;126(11):4250-4261. https://doi.org/10.1172/JCI86504. Little is known about the role of mTOR signaling in plasma cell differentiation and function. Furthermore, for reasons not understood, mTOR inhibition reverses antibody-associated disease in a murine model of systemic lupus erythematosus. Here, we have demonstrated that induced B lineage–specific deletion of the gene encoding RAPTOR, an essential signaling adaptor for rapamycin-sensitive mTOR complex 1 (mTORC1), abrogated the generation of antibody-secreting plasma cells in mice. 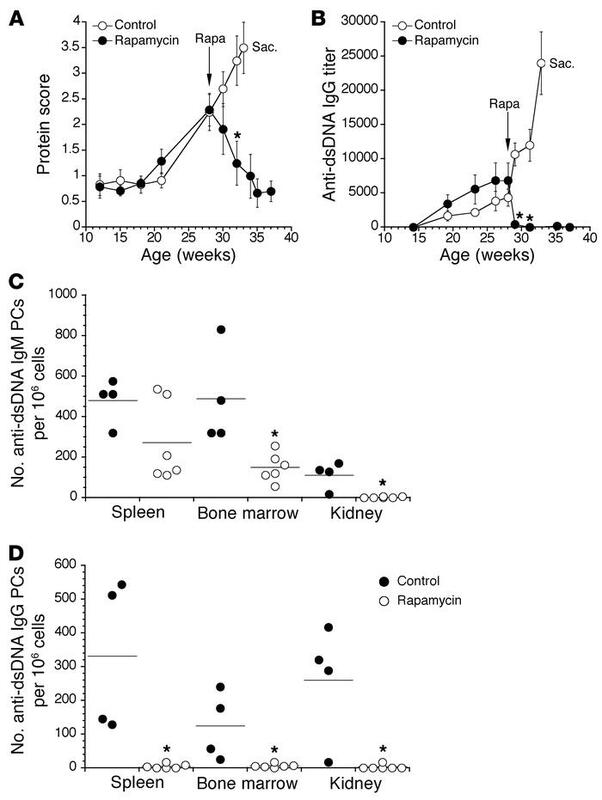 Acute treatment with rapamycin recapitulated the effects of RAPTOR deficiency, and both strategies led to the ablation of newly formed plasma cells in the spleen and bone marrow while also obliterating preexisting germinal centers. Surprisingly, although perturbing mTOR activity caused a profound decline in serum antibodies that were specific for exogenous antigen or DNA, frequencies of long-lived bone marrow plasma cells were unaffected. Instead, mTORC1 inhibition led to decreased expression of immunoglobulin-binding protein (BiP) and other factors needed for robust protein synthesis. Consequently, blockade of antibody synthesis was rapidly reversed after termination of rapamycin treatment. We conclude that mTOR signaling plays critical but diverse roles in early and late phases of antibody responses and plasma cell differentiation. mTOR inhibition reverses disease in lupus-prone NZB/W mice. (A) NZB/W mice were monitored for urine protein levels using colorimetric reagent strips for urinalysis. Rapamycin treatment (rapa; 20 mg/kg/mouse) was initiated at the indicated age and continued twice weekly for the remainder of the experiment. Control mice were deemed moribund at week 33, and were sacrificed (Sac.). Protein scores were graded on a semiquantitative scale: 1≥, 30 mg/dl protein; 2≥, 100 mg/dl; 3≥, 300 mg/dl; and 4≥, 2,000 mg/dl. (B) Titers of dsDNA-specific serum IgG were determined using ELISA. Data represent mean ± SEM and are representative of 2 separate experiments each using 4–6 mice per group. *P < 0.05 (A) and *P < 0.01 (B) as determined using Student’s t test. (C) Cells from the indicated organs were applied to dsDNA-coated ELISPOT plates. Shown are numbers of IgM (C) and IgG (D) anti-DNA-secreting plasma cells (PCs). Control mice were analyzed prior to rapamycin-treated mice due to advanced disease; therefore, the data were normalized to numbers of plasma cells per 106 cells. Dots represent values for individual mice, and horizontal lines indicate means. *P < 0.05 as determined by Student’s t test comparing control mice with rapamycin-treated mice within the same organ.